For the past two years, High Country News has been building a tribal affairs desk that centers Native voices for a Native audience. We have published more than 170 stories from journalists, authors and experts across Indian Country, and we are proud of how far we’ve come and optimistic about where we are going. 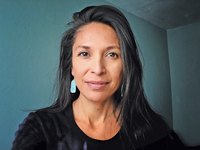 Jenni Monet is a freelance journalist and a tribal member of the Laguna Pueblo. The idea of the desk evolved from our coverage of the Standing Rock demonstrations in 2016, as violence, repression and intimidation increased against water protectors by state security forces along the proposed route of the Dakota Access Pipeline. High Country News turned to readers with a request for support. We received more than $13,000 in donations, which funded our coverage, enabling us to commission an Indigenous writer, Jenni Monet. Monet’s reporting helped us realize that as a magazine dedicated to covering the American West, we were woefully lacking Indigenous voices. We subsequently hired Tristan Ahtone, an experienced Kiowa journalist and officer of the Native American Journalists Association, to lead the effort. Associate Editor Tristan Ahtone leads High Country News’ tribal affairs desk and is a citizen of the Kiowa Tribe. We are the only non-Native outlet in the country with such a desk, and just two years on we are receiving national and international recognition, allowing us to continue building out our initiative and committing to keeping the tribal affairs desk as a core component of High Country News coverage. Just last week, the Columbia Journalism Review highlighted the substantial work that we have produced, though their figures were incomplete. In fact, from June 2017 through March 2019, we published 171 tribal affairs stories. Of those, more than half were written by Indigenous writers, a significant portion of which were by Native women journalists. We have also prioritized the commissioning of photography and illustrations from Indigenous photojournalists and artists. Last year, our Indigenous writers won four 1st place awards from the Native American Journalists Association, while two of our non-Native writers also won 1st place awards for the organization, including best feature and best coverage of Native America. Our impact on international news outlets continues to grow – from our recent collaboration with the BBC to stories with Buzzfeed, the Intercept, the Investigative Fund, and AJ+. We could not have done this without our readers. Debra Utacia Krol is an enrolled member of the Xolon (also known as Jolon) Salinan Tribe and an award-winning writer for High Country News. Authentic representations of Indigenous people matter. For nearly a century, Native people were covered, if at all, by stereotypes (as warriors, or through drumming, dancing, or drinking), or by narratives of “difference, disparity, disadvantage, dysfunction and deprivation,” as scholar Maggie Walter writes. As a result, Indigenous people often exist in the collective memory of the United States — informed by films, literature, sports and advertising — in ways that prevent audiences from engaging with authentic, contemporary, Indigenous communities. From “noble warriors” to “wards of the state,” the narrative of defeat and impending extinction of Indigenous people permeates perceptions and shared histories of Native America. HCN’s tribal affairs desk endeavors to do better, seeking not to write about Indigenous communities — but to write by, for and from them. Our aim is to avoid inaccurate representations of Indigenous life, and to recognize a rich and complicated network of cultures, subcultures, political points of view, religious persuasions, sexual and gender identities, creation stories, histories and aspirations — to name a few. We recognize that to tell the complete story of the American West, we must do so from multiple viewpoints and histories: From the Siberian Yupik village of Gambell on St. Lawrence Island, Alaska, to the Tohono O’odham Nation on the U.S.-Mexico border, our reporters have challenged preconceived notions of the West, and, by extension, Indian Country as a whole. When we started the tribal affairs desk in the spring of 2017, we began with a public service journalism model in mind: provide fact-based, in-depth reporting on topics essential to Indigenous communities, while engaging tribal citizens in all aspects of public affairs. The work started to win us trust among readers and credibility with sources, and it has attracted a growing number of Native reporters and subscribers — no easy task in communities that have long been misrepresented and burned by reporters. At a time when trust in journalism is at an all-time low, HCN’s concerted, dedicated reporting in Indian Country has proven a boon. This is because readers, and funders, have recognized the importance of our work and supported it. From the early, budding days of the desk when we supported a single Native reporter at Standing Rock, through our efforts today, as we dedicate resources to everything from Indigenous film reviews to investigative journalism, we are proud of what we’ve accomplished, and, with our readers’ support, where we are going.